Physical design is the decomposition of the source code into directories and files, such as header files (.h files) and implementation files (.c or .cpp files), as well as "makefiles", build scripts, etc. The critical aspects of physical design is managing the inter-dependencies among the source code modules as well as information hiding policy to expose only the desired interfaces in the header files. Additionally, physical design of automatically generated source code must also afford a sufficiently flexible way of interfacing with hand-crafted code or any existing 3rd-party code. In QM™, directories and files are first-class model elements, so the physical design is an integral part of the model, just as the logical design is. This approach makes QM™ a unique tool on the market that allows you to explicitly perform physical design of the generated code as an integral part of the modeling process (as opposed to tweaking the code generator or adjusting hundreds of parameters of a "model compiler"). If you have used other modeling tools, the QM™ approach might feel like turning code generation "upside down", because QM™ does not impose any code structure by itself, but rather gives you the complete control of what is being generated. In contrast, most other modeling tools on the market use an implicit and inflexible physical design, in which, for example, each class generates <class-name>.h header file and <class-name>.c/.cpp implementation file. 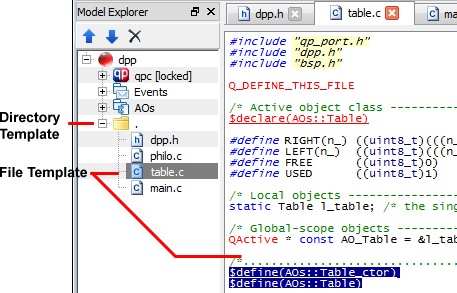 QM™ supports also External Files, which combine the user-provided code with sections of generated-code. This merging of a file-template with generated-code is achieved by clearly delimiting the generated-sections with special comments. Such External Files can be edited inside any editor/IDE of choice and are not editable inside QM. 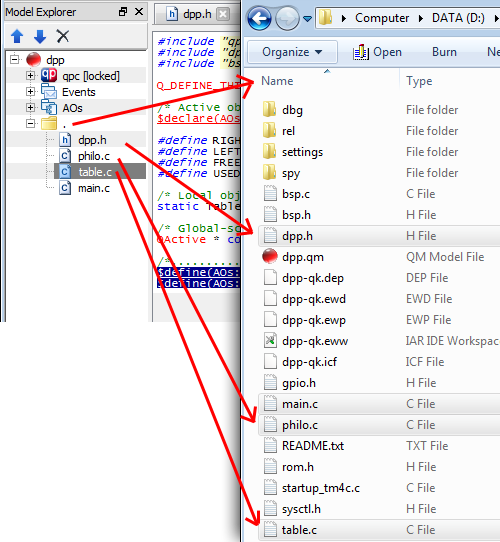 The following picture shows how the directory-"template" and file-"templates" in the model generate the physical directory and files on disk. The code generation process is depicted as arrows from the model items to the files on disk. The model items for modeling directories and files were called in this section directory-"template" and file-"template", respectively, so that you can get used to distinguishing the model items from the physical directories and files on your disk. In the following sections, however, the model items will be simply referred to directories and files, with the understanding that a model can hold only the "templates" for directories and files. The parts of code generated by QM™ are compliant with the Motor Industry Software Reliability Association (MISRA) Guidelines. Specifically, the QM code generator for the C language emits code compliant with the MISRA C:2004 and the QM code generator for the C++ language emits code compliant with the MISRA C++:2008. Of course, the compliance with any coding standard, such as MISRA, can be guaranteed only for parts of code actually created by the tool. The other parts of the code, such as code copied from the file-templates or action code attached to state machines, is provided externally to the tool. Such code might not be compliant with the MISRA rules.